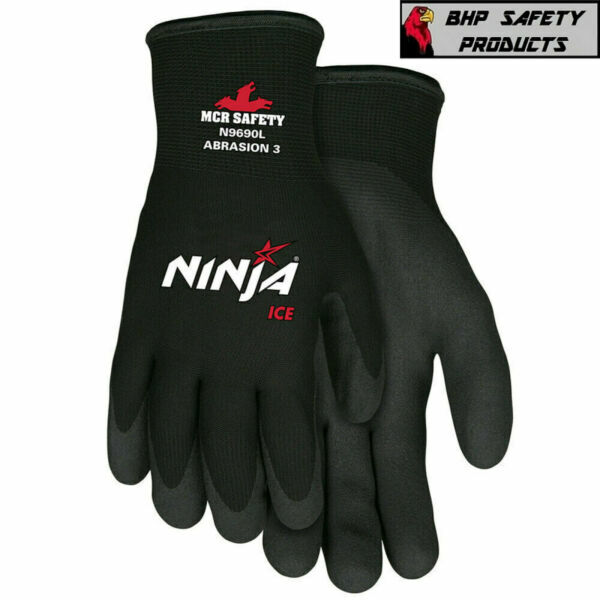 eBay MEMPHIS NINJA ICE INSULATED WORK GLOVESHPT PALM COATING N9690SIZES SMALL-XL1 PAIR MCR Safety Ninja® gloves are engineered to provide the highest level of innovation. Each of the offerings in the Ninja® series include a unique shell and polymer combination incorporating the latest in hand protection technology. Our Ninja® Glove Line offers the greatest assortment of dexterity, sense of touch, and protection. The Ninja® Ice gloves features a 15 gauge black nylon shell with a 7 gauge acrylic terry interior liner. Black HPT coated palm and fingertips. FEATURES: ▪ Acrylic Terry liner for insulation / warmth. ▪ Black HPT repels liquids while providing strong wet or dry grip ▪ Coating remains soft in temperatures as low as -58 F APPLICATIONS: Cold storage applications, Commercial fishing, Frozen food packaging, Agriculture, Construction, Material Handling. YOUR 100% SATISFACTION IS TOP PRIORITY! BHP SAFETY PRODUCTS main motivation is for our customers to be 100% satisfied with their purchase. If any consumer has something unsatisfactory with their product or transaction, please contact us immediately and we will do everything necessary to correct the problem and guarantee our promise. **TIME OF DELIVERY** BHP SAFETY PRODUCTS processes and ships orders Monday thru Friday 8:00AM – 5:00PM EST with the exception of National Holidays. We currently ship 93.8% of our orders the same day they are received and 99.6% within 24 hours. **WARRANTIES** We guarantee all of our products to be new and free from all manufacture imperfections. Factory defective items may be returned within 30 days of receipt. At which time a replacement will be sent at our expense or a complete refund of the transaction. **PAYMENT** We accept only PayPal **FEEDBACK** Our goal is to earn a 5 star rating from every business transaction. When you receive your product, please take a moment and post us a positive feedback. When your shipment leaves our warehouse, we will automatically post you a positive feedback! THANK YOU FOR SHOPPING WITH US!